Last week my wife and I made a trip to Portland to visit my family. Portland has a nice up-and-coming craft distillery scene, and I was going to make certain that at least some of my time was spent getting to know that scene a bit more. My brother-in-law shares in my enjoyment of whiskey, so I had my partner in crime. Distillery Row is comprised of seven craft distilleries near downtown Portland, all, for the most part, within walking distance of each other. 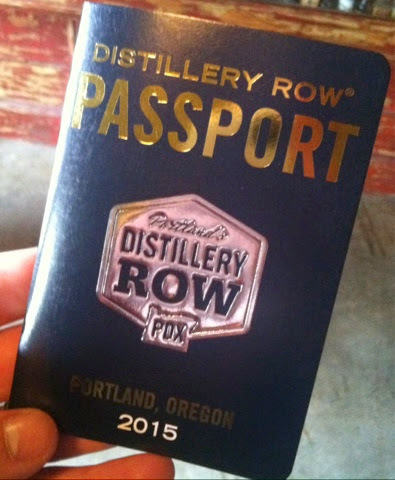 To do a tour, all you have to do is stop by any one and purchase a Passport for $20, which gets you tastings at each distillery. I couldn't really go wrong! Our first stop was at House Spirits Distillery, makers of the Westward Oregon Single Malt Whiskey that I've reviewed previously. Obviously I was already a fan of their whiskey, but I was eager to try their other products as well, including their best-seller, Aviator Gin. After there we went to Eastside Distilling, New Deal Distillery and Stone Barn Brandy Works, hitting more than of Distillery Row on the first day. We also went across town to check out Clear Creek distillery, a distillery known for growing pears and apples inside the bottles they use for their brandy. It's really nothing more than a gimmick, as they merely pour the brandy over the fruit when bottling, but pretty neat nonetheless to see a full pear inside a bottle of brandy. On the second day we finished the tour, hitting Rolling River Spirits, Vinn Distillery (offering gluten free products made from rice, including a spirit called Mijiu, which I've never had before), and Wild Roots Vodka, specializing in infused vodka. I've dedicated this blog to whiskey reviews, so I'll keep the focus on whiskey. However, below I've also identified what I think were the best of the best in other categories. As to the whiskey, I knew I was already a fan of House Spirit's Westward Oregon. Only one other distillery, however, had bourbon. Eastside Distilling offered Burnside Bourbon, a young bourbon aged 4 years, and Burnside Oregon Oaked Bourbon, a double barreled bourbon. I found the 4 year bourbon much to my liking, offering many of the notes and flavors expected in a bourbon. However, it's age showed, as it was missing the depth and boldness of a more well-aged bourbon. 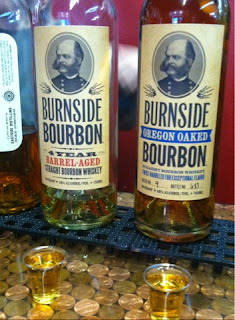 The Oregon Oaked bourbon was a lighter bourbon, reminding me more of a single malt. It was not a very complex bourbon, and lacked any sweetness or spiciness found in traditional bourbons. They also had cherry and marionberry infused whiskies, both of which I found far too dominated by the fruit flavor, and would expect these to primarily be used as mixers. New Deal Distillery did not have any whiskey offerings. However, they had a special event the following day, and in conjunction with that event, they were releasing a small batch bourbon. Because I enjoyed all the other products New Deal had to offer, I went ahead and purchased a bottle, which will surely be the subject of a review once I find the bottom. Again, however, because of the bourbon's young age (aged only 1 year), other flavors came to the front, notably orange peel. Stone Barn Brandy Works offered one of the more unique whiskeys, a white Oat Whiskey. I found it interesting, but lacking in flavor for the most part. Their Hoppin' Eights Whiskey reminded me of a Canadian Whiskey, but with a little more bite. Finally, Clear Creek Distillery, which specializes more in Eaux de Vie and Brandy, had a single malt whiskey, much in the Scotch tradition. For a 3-year old whiskey, this was a smooth pour, carrying a slight peatiness and a mild oak flavor. It had a clean finish, and I expect that at some point I'll be tracking down a bottle of this to give it a full try. Best Gin: There was a progression here. I started with Aviator Gin, an excellent Gin from House Spirits. I then tried the Portland Dry Gin 33 and Gin No. 1 from New Deal, and I was torn as to which I liked best. However, on day two I finally made my way to Rolling River Spirits. They only had two spirits available, a vodka and a gin, and their extra attention and focus to the craft of these spirits definitely showed in the final product. The Rolling River Gin is possibly the best gin I've ever tasted. It's light, mildly fruity, with notes of lavender. This was one of my favorite spirits I tasted the whole trip! Best Vodka: I am not a vodka drinker, and I was not jumping at the opportunity to try every vodka put in front of me. However, the Rolling River Vodka was very impressive. It was a very smooth vodka, with minimal burn that went down very well. I don't drink much vodka, but I could enjoy this stuff! Best Flavored Vodka: I couldn't pick just one here, so I've got three. The first is the raspberry infused vodka from Wild Roots. This stuff tasted like raspberry jelly. I could just pour it over ice and drink it. New Deal Distillery had two incredible flavored vodkas. 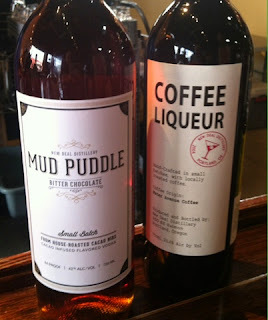 Mud Puddle is a cacao infused vodka which tasted like baking chocolate and was phenomenal. Their other flavored vodka was a product called Hot Monkey. This hot pepper flavored vodka not only has a great name, but it's flavor and kick were great, really profiling the flavor of the peppers, and not just the heat. Best Coffee Liqueur: Being in Portland, nearly every distillery had a coffee liqueur, each getting their coffee from a local brewer. While each and every one was very good, the Coffee Liqueur from New Deal Distillery (made from Water Avenue Coffee) was at the top of the list for me. This may be a personal preference more than anything, however, as this was the sweetest of the coffee liqueurs that I tried. Honorable Mentions: The Oregon Brandy from Clear Creek Distillery was excellent, a very complex spirit that I actually enjoyed even more later the next evening, as my brother-in-law had picked up a bottle. The rhubarb liqueur from Stone Barn Brandy Works was like drinking dessert. Finally, the Below Deck Spiced Rum from East Side Distillery was excellent, one of the better spiced rums I've had (topping an admittedly short list).